LEARN Tutoring has gone through a major transformation in the last year and a half. 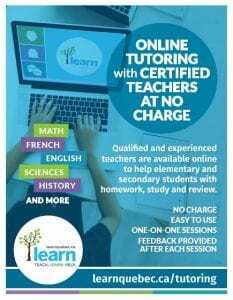 Several substantial changes were made, all with the goals of improving, and having more students/families take advantage of, our service – one-on-one or small group tutoring sessions provided by certified qualified and experienced teachers, available to students in English schools in Quebec at no charge. The upgrades made to LEARN Tutoring (formerly known as SOS LEARN) include: easier registration process, one-click access to online class sessions, scheduled appointments instead of drop-in sessions, e-mail reminders of sessions, and, the focus for my post, feedback! After each individual appointment or group session, our tutors provide feedback related to who attended, what was covered, and comments on identified strengths and next steps. As you can imagine, sending out all of this information on a weekly basis is time-consuming, however, I feel that it has added tremendous value to our service. By sharing feedback, we open up a conversation, initiate a connection, with schools and parents. I send feedback from the tutoring sessions to every tutored student’s school and invite the school principal to share with the appropriate teacher(s), thereby including LEARN tutors in the student success loop. When schools receive my weekly e-mails, principals and looped-in teachers can see that students in their school are using the service, and they can reply with information to help LEARN tutors better support specific student needs. Some teachers even send our tutors specific topics to focus on with students that week. Schools can also share strategies that have helped their students. Teachers know what students reviewed with the tutor that week, and can see the results in assignments or evaluations. Over 90% of our requests for tutoring come from parents so, of course, they receive the weekly e-mails too. Feedback to parents has been extremely well-received. Most elementary parents and many secondary parents sit right beside their children during tutoring appointments, listening, supporting, and often speaking directly to the tutors. After receiving our Feedback Friday e-mails, parents often tell us what this service has meant for them and their children. My favourite part of working with LEARN Tutoring is receiving feedback from families! Please share your feedback below, in the form of a comment.